Larry Haiven is a professor emeritus in the Department of Management at Saint Mary’s University, a member of the Steering Committee and spokes for Nova Scotia Parents For Teachers and a member of Solidarity Halifax. Originally published in the Local XPress. 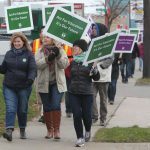 In one of the boldest acts of civil disobedience in the province’s history, Nova Scotia’s teachers, a most unlikely group, voted last week for the third time to reject the government’s public sector bargaining agenda. 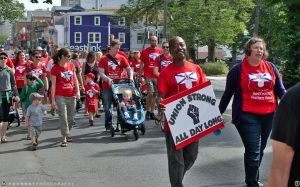 The Nova Scotia Teachers Union has been around for over a hundred years and had never had a provincewide strike in its history. Not only the premier and his cabinet, but many other Nova Scotians expected the 9,300 teachers to fold quickly and set a pattern for the other public service workers. It was not to be. Eager to balance the provincial budget by the end of its first term, the Liberal government has declared war on labour. It introduced a spate of restrictive legislation, beginning by gutting first contract arbitration, then banning a strike by home-care workers, then imposing an essential services regime on 40,000 health and social services workers, then attempting to gerrymander health-care bargaining units (which blew up in the government’s face) and then giving universities the power to declare financial exigency and bypass collective agreement provisions. In December 2015, it introduced Bill 148, giving it the power to impose a strict limit on public-sector pay and forbidding even arbitrators from awarding more. It held and still holds that passed but unproclaimed law over the heads of 75,000 workers. It now proposes, in a deeply arrogant, cynical and undemocratic act, to impose a collective agreement on the teachers. Most of the rash of legislation is arguably counter to the Supreme Court of Canada’s recent ruling that collective bargaining and strikes are protected under the Charter of Rights and Freedoms. A strike can be forbidden only if unfettered arbitration is allowed in its place. But the Nova Scotia Liberal government wants neither strikes nor arbitration and is willing to defy the courts to get its way – even if only temporarily. The government’s desire to eliminate the provincial deficit immediately is curious in light of political trends. The provincial Conservatives announced they had balanced the budget during their time in office. But they received ever-dwindling minorities and finally lost in 2009. The subsequent NDP government declared it too had eliminated the deficit, but lost the 2013 election. In 2015, Justin Trudeau’s Liberals swept to a resounding federal victory promising NOT to immediately balance the budget. Nova Scotia’s deficit and debt-to-GDP ratio are well within reasonable boundaries, and declining. But the ideology of austerity and a visceral hatred of unions has seized the McNeil government and it has thrown caution to the winds. In addition to doing little to reform the classrooms, to add insult to injury, the government will impose a four-year wage package that would, at even the current low rates of inflation, spell at least 4 ½-per-cent pay cut for teachers. Moreover, the government wants to eviscerate a long-service award (LSA) paid to teachers upon retirement or death. The LSA is a package negotiated in lieu of a wage increase some decades ago and is thus deferred wages. By keeping their own money in the government’s bank for these decades, the teachers have in fact saved the taxpayers millions of dollars. This kind of stubborn labour resistance is not new to Nova Scotia. In 2001, health-care workers similarly rejected settlements negotiated by their unions and threatened to resign en masse before the government came to its senses. Crown attorneys went on strike illegally in 1998 to obtain the right to bargain collectively. Why would workers, especially faced with a government wielding a big stick, with angry members of an inconvenienced public yelling for their hides, with their own unions recommending concession, lie down on the tracks and refuse to let the train go through? There is now plenty of experimental evidence showing that not only humans, but also many animals, have a strong drive to fairness and will refuse to go along with perceived injustice even when they themselves will suffer loss and pain. In what’s called “The Ultimatum Game” people will refuse new money they never had if they think they are being unfairly discriminated against by the game leaders. Capuchin monkeys will refuse to play games with experimenters if they see other players rewarded disproportionately to them. Economists Samuel Bowles and Herbert Gintis call this principle “strong reciprocity.” In their book A Cooperative Species, they argue that, far from being driven by greed and individualism, human beings will often take desperate measures and engage in deep sacrifice to ensure that the species remains co-operative. This behaviour especially manifests itself when people are backed against a wall and where surrender seems to be the most rational option. That explains a lot about unions and collective bargaining. But it also explains a lot about our teachers, who after doing one of the most difficult and complex jobs around, are standing up for themselves, their students and all of us.